One of the highlights of market for me was meeting Aneela Hoey. She was very gracious and lovely to talk to. Her blog can be found here. Some of you may have seen this little video about Aneela Hoey and her new fabric line Little Apples for Moda. This is one of the cute-sie prints. At market I picked up one of the sample kits for a stitchery and a pillow using Little Apples. If you'd like to win this little bag with a stitchery pattern and a 2.5" charm pack of Little Apples just leave a comment here. I will pick a winner on 6/4/11. I would absolutely love to win the little bag of goodies. Love her new prints and colors too! love the green/gray colors in this line! would be thrilled to win! Well that is just the cutest thing (the fabric line AND that dinky wee charm pack!) and I would dearly love to rehome it. Isn't Aneela a sweetheart, too? Count me in! I would love to win the little bag of goodies! Aneela's fabric designs are so adorable. Love the sketches of little children. Thanks for sharing such a fun and generous giveaway. I have seen this fabric recently and LOVE IT. How wonderful of you to give us a chance to win this sweet kit and fabric. I love this new range! Thank you for the opportunity to win such a fab giveaway! Oh, for some Little Apples to go with my Sherbet Pips!! Thanks for the chance to win!! I think this would make a great fun project, count me in! Cute! Love these more than sherbert pips! Wow I would love these goodies. Hope you are feeling better with each new day. Hi Vickie! Hope you are on the mend! Maybe we'll see you soon? Hope so! Thanks for a chance. I've already stashed some Sherbet Pips, just love her fabrics. I don't know what I love more - the hula hooping girl or the girl lying on the grass reading a book. The fabric line is scrumptious. Thanks for offering the giveaway. How lovely that you were able to meet her in person! I would love to win that little pack! =) Thank you for a sweet giveaway! I can see a lot of cute quilts being made from this line - thanks for the chance to win! Would love to win that little stitchery kit... I am a follower of her blog and am looking forward to Apples coming out in the fall.. Very cute - I would love to win this little goodie bag. What a great new line of fabric! Thanks for sharing the video and for this giveaway. It would be fun to win! Little Apples is the cutest! Thanks for the giveaway! Cute giveaway, that would make my day! I love the fabric line and would love tot do some stitching as well! I love the kids! Pick me, pick me! I'd love to win this kit - this fabric is just so cute! I'd love to be the lucky winner.The fabric is fantastic. 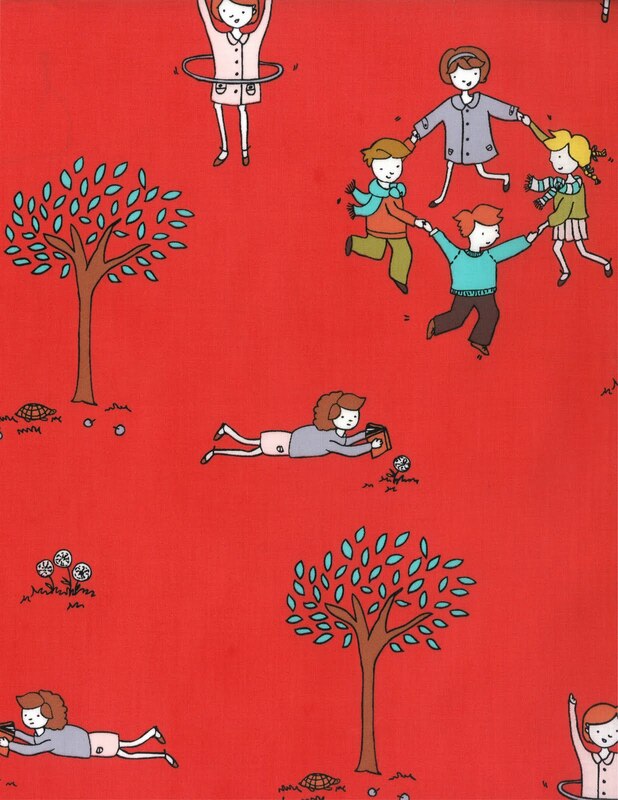 I love the little girl reading under the tree in this pattern. This reminds me of my daughter! Would love to win this! I love Aneela's fabrics and sweet embroideries! What a nice giveaway! How fun - thank you! Great fabric! Thanks for a chance to win! Please enter me in the drawing. I'd love to win this darling fabric! Thanks for the chance! I love Aneela's new fabric. I was just at her blog and you're right, it is fun. I always love coming to your blog as well. Thanks for the give-away chance. You are so nice to share that lil bag in a giveaway!! thanks for the chance!! I would love to win! I love her Sherbit Pips and her new fasbric is so cute too! I love Aneela's fabrics. They are so whimsical and fun. Really different from everyone elses, which is hard with so many fabrics out there. I would LOVE to win this. I didn't think it was possible, but I think she has outdone Pips. Too cute! Such cute fabric! I'd love to win this little bag. Thanks! I love that line...sooo cute. Aneela's work is so adorable! I would love to make a little pillow! This line is so adorable!! How fun, thank you. I can't wait to watch the video on your post. I'm going to wait until my daughter is at school and the house is mostly quiet. What a great mini these would make! Love any of the new lines using grey! I wanna win!!! I think this new line is so cute. Aneela is a talented lady. I would love to win that little package and I love that fabric, it is so fun. What a fun and fabulous giveaway, please count me in. I would be so excited if I won this wonderful giveaway! Thanks for the chance. The line is so cute. I would love to win a little bag of goodies. Love little apples! Thanks for the opportunity to win! I would love to win that darling fabric. Count me in! I would be THRILLED to win this kit!! LOve this fabric! Thanks for the chance! What a generous giveaway! I love it - especially the children holding hands in a circle! VICKIE,THIS IS SUCH A SWEET GIVEAWAY! I would love to win this little goodie bag! Oh, boy, would I love to win that little goodie bag! I would love to win that cute little red bag. Little Apples is such a happy looking fabric collection. How sweet of you to have this cute fabric giveaway! Thanks! i would love to win.thanks for sharing your treasures. This line is so cute! And I love the colors! This fabric looks cute. thanks for the opportunity. How fun. I'd love to win. Her print is sooo cute!! I would love a chance to win this!! Thank you!!! What cute prints! I hope you mend quickly. I am so glad you posted her video. I have seen hundreds of posts from Market but not any videos of Aneela. She is just adorable. I love her accent and miss hearing that accent. My Grandparents were from near London but moved to the USA in the 50's and have both since died. Neither of them ever lost their British accents in the 30+ yrs they lived here in the States. Anyway, I just adore Aneela's newest fabrics. They are all just super cute. Thank you so much again for her video and the chance at the giveaway. I m really liking her new designs! I have seen her Little Apples fabric! So cute! I have loved this fabric since the first time I laid eyes on it. Thanks! Yes please! I love Aneela's work! I would love to win! So sweet. Excellent! I'd love to win. such a sweet fabric... I'd love to win it! Please pick me! Adorable - I would love to win this! Cute, cute, cute! I love to stitch and would love to win. :-) Thank you so much for the chance! I love this fabric line, but sadly, my LQS won't be carrying it! This would be an awesome prize to win! :) Thanks for the chance!!! This is such cute fabric! Great, fun designs! Oh wow! I'd love to win, thanks for the chance. Little Apples is adorable! Would love to win the stitchery and fabric! I think those mini charm packs are the cutest. Thanks for the chance to win! Yes please, I would love to win her new fabrics. So cute. Who wouldn't love to win? You are so great. Always sharing such fun stuff with us. Thank you!! How fun! I love Annela's new line and can't wait to get some of it. I would be so happy to win that great little bag of goodies! I'd love a chance to enter! Oh I would love to win this little bag of goodies!! Thanks for the chance! Yes, thank you, please I would love to win this! Would love to win this!! Thank you for the chance! This would be fun to win. Thanks. Her fabrics just make me smile! My pips would really like to have some apples to play with, lol. Little apples is very cute. Thanks for the chance to win some. This little kit is too cute. Thanks for the giveaway. Very cute patterns, and great colors...would love to win! What a fun giveaway! Very cute! I hope you are well on your way to recovery. I would be delighted to have a chance to win Aneela's fabric! i would love to win a charm of Little Apples & a stitchery pattern. Thanks for the chance And thanks for the little video. How cute is that fabric with the children playing ring-a-rosie! Thanks for the chance to win. I'm still not over Sherbet Pips . .But I sure can get into this new line too. This is my second favorite line to come out! I love Little Apples! I would love to win the bag of goodies. How nice that you were able to meet her. I loved her Sherbert Pips line. This looks just as fun! The Little Apples line is so cute. I'd love to win. Thanks for the chance. Oh yes please! Would love the win. I often fall in love with cutesy fabric lines, and imagine what I would do with them. Normally I just want to frame some and display it, so to appreciate it for a while before actually digging in. Aneela's stitchery designs are very cute! I really want to add some of her Little Apples to my stash of 2.5" squares. I've been collecting these square for a just a little while and have a couple of ideas for using them! Would love to win some little apples, it is so cute! These fabrics would make a wonderful kids quilt for my great niece. Her parents are going through a divorce so she could use a comfort quilt. Thanks for the generous giveaway. Oh yes please :) Can't wait for this fabric to be released! LOVE. And Aneelas wee patterns are the sweetest. Id love to win, thanks! And wow, look at all of the fabulous jelly rolls at the end of the post!!! This is a fantastic giveaway, I LOVE Little Apples. Thanks for the chance to win. This line of fabric rocks! I love Aneela's work! Great giveaway! Thanks! Oh please!!!!! The fabric is fab! How lovely~ a bag of goodies! Thanks for the chance! ooo! i'm so jealous that you already have a bit of this! thanks for sharing! Lovely fabric! Would be so happy to win it. June 4 is my wedding anniversary! It must have been so cool to meet her! I just finished a quilt with Pips and I would love to work with some of those apples! Thanks for the chance to win. The embroidery pattern in the goody bag is so cute. Pick me!!! Somewhere in the past two weeks I've seen the embroidery pattern made up - it was so cute! How fantastic for you!!! I would love to meet Aneela. I real feel she has climbed inside of my head and pulled out all of my childhood memories. Her fabrics really, really, really make me smile, so much so that I smile just when I think of them. Wonderful childhood memories abound. (also lets me know that dementia hasn't started to set in yet if I can remember that far back)!!! I would love to win the stitchery and charms. Thank you for the chance to add "little apples" to my sewing projects. Hi Vickie! Hope your recovering nicely...I'd love to win this little treat! :) Thanks for thinking of us. This fabric line is very cute. Thanks for the giveaway. Making a pillow out of those little squares and stitchery sounds like a fun project! I love getting to hear Aneela talk about her fabric. Thanks for sharing the video and for the great giveaway! Thank you for the giveaway! Who wouldn't love to win this! What a great giveaway I'd love to win this! Such a generous giveaway! Thanks for the chance! Love Aneela's fabrics and embroideries! Would dearly love to win some. Thank-you! I am smitten with Little Apples! It is A D O R A B L E!!!!! Here's hoping!! Little Apples......yummy! Thanks for the giveaway. I hope you will be back to dancing soon after the surgeries! Super cute. Super cute everything in the photos. How adorable!! Thanks for the chance! Wow! I've been looking for a family themed print for some family game projects that I have in mind. This print would be simply perfect! May health be on your side and luck on mine. ;-) Thanks! I just love Little Apples! oh, such a sweet new line! thanks for the chance to win, i know just what i would make with these! I love this line of fabrics. I would be so happy if I won. Thanks for the chance! What fun! Thanks for the giveaway. Really cute fabric. Good luck everyone! Little Apples is so cute. Would love to win whatever is in the mystery bag! oh wow! I love her fabrics!! I love Aneela's Sherbert Pips and I'm looking forward to this new collection. Thanks for the chance to win some of the fabric early. Love anything to do with apple orchards. Have such happy happy memories of times in my grandfather's orchards. Now live on my parents land that once was apple orchards so this fabric would be great to have. It's so cute! Thanks for opportunity and have a great day! I'd love to win the stitchery pattern and mini charm pack. Thanks for the chance. Thanks for the giveaway! I love this line of fabric. Hope you are recovering well and will be back to sewing soon! Such a sweet fabric line....thanks for the chance to win some goodies! Ooh!! So cute! Those would look great in my hexi quilt, wink wink!!! I'd love a chance to win p;ease. 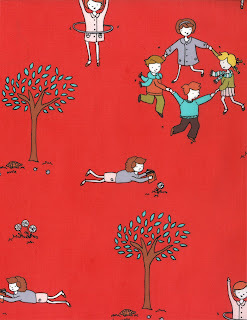 I love that bright red print with dancing children. Oh, I almost missed out on this one, Cute fabric. Thanks for the giveaway Vickie. What a neat bag of treats! Thanks for the giveaway!